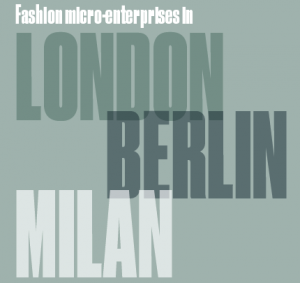 We are pleased to have completed the report for the first phase of our CREATe WP on Fashion Start-Ups and IP: London, Berlin and Milan. The style of the report mirrors the qualitative and observational approach we adopted. We interviewed designer and we got to know a range of experts, policy makers and fashion producers. We organised events which got people talking to each other and in many ways the life of the project took off and carries on. Overall we would like to see UK cultural policy-makers find ways of supporting more small scale independent designers with the possibility for subsidised spaces in good locations in town centres where passers-by could see and possibly buy their clothes. This is specially the case for smaller towns and cities outside London. Where shops lie empty or only are re-opened as charity shops we would like to see these interspersed with designer shops which could also make use of the back-shop as studio space. This system exists in Berlin and could be rolled out easily in many British cities. We also see the fashion design sector as a field for supporting women’s work and employment especially in the light of the economic recession and austerity. We note that IP and copyright issues are deeply embedded into the tangle of concerns which make the idea of creative entrepreneurship so difficult to sustain, despite the enthusiasm and commitment as well as talent of so many young and not so young designers.